Social media promised a new ability for brands to engage with and build relationships with their customers. So why does Pepsi have such a simple Facebook feed? 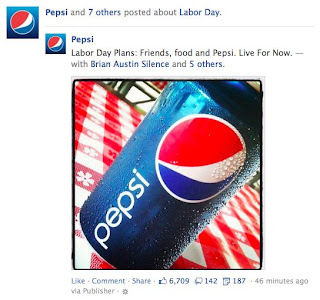 If you “Like” Pepsi in Facebook, here’s what you get: A series of Pepsi cans in your Facebook feed. Cans. And more cans. Blue cans with the Pepsi logo, blue cans in front of walls, blue cans on blue cans sitting in the sand at the beach. Anyone savvy in marketing might wonder, Pepsi, can’t you do better than cans? Why aren’t you engaging with your Facebook customers? 1. Engagement doesn’t work for everyone. Two decades ago, the one-to-one guru Don Peppers posited that engagement (he called it personalization) only made sense for companies whose customers had wide variances in terms of what they need from you and the financial value they provide to you. Book readers and movie renters have wide ranges in needs, so it makes sense that Amazon and Netflix became experts in personalizing recommendations. Personal investors have wide ranges in financial value, so of course financial advisors treat Jane different from Jim when they call. The more diverse the needs and values, the more critical engagement — and its corresponding personal feedback — is to persuade customers to do business with you. But if all of a brand’s customers simply want the same commodity, it makes little sense to personalize communications or engage in meaningful two-way conversations. Gasoline, laundry detergent, kitchen ovens and sodas are all simple commodities. Customers of such products have little range in value, so treating me differently than you won’t really drive more sales. So Pepsi is doing the right thing — it’s ignoring the expense of engagement and simply spraying everyone with one simple message. We have pretty blue cans. 2. Frequency is important. U.S. consumers are exposed to thousands of advertising messages each day: more than 160 television spots, scores of web pages, and hundreds of social-media updates. The typical Facebook user makes 3.5 “Likes” or comments daily, and with the average user having 234 friends, he or she (Facebook Edgerank filters notwithstanding) could be exposed to 820 messages bouncing back to them daily. Brands must break through this clutter, and the best way to influence consumers is to focus on frequency — the idea that it takes 3 or 4 outbound messages per week for a brand to penetrate a consumer’s mind. By peppering you with blue Pepsi can images, Pepsi is building a frequency of advertising impressions that might influence you next time you’re shopping in the soda aisle. 3. Social media is not “social” most of the time — because if one-way communications are a worthy goal, the “social” is gone and all that is left is broadcast media. This sounds cold, but most of social media has turned into broadcast as users spray other users with their wit, links and thoughts much more than they engage in two-way conversations. If you don’t really listen to the 1,000 people you connect with on Twitter, what chance does a non-corporeal brand have to really engage with you? Pepsi is doing the right thing by turning social media into a spray-and-pray advertising platform. That’s the hard logic of a world where there are more commodity brands who want to engage with you than you have attention to give back in return. Pepsi may seem annoying in your Facebook stream, but look again, people: All Pepsi is doing is making its soda pop.